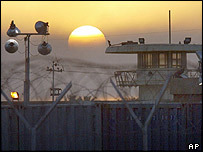 Children as young as 11 years old were held at Abu Ghraib, the Iraqi prison at the centre of the US prisoner abuse scandal, official documents reveal. Brig Gen Janis Karpinski, formerly in charge of the jail, gave details of young people and women held there. Her assertion was among documents obtained via legal action by the American Civil Liberties Union (ACLU). The Pentagon has admitted juveniles were among the detainees, but said no child was subject to any abuse. Brig Gen Karpinski made her remarks in an interview with a general investigating the abuses at the prison. The transcript of her May 2004 interview was among hundreds of pages of papers obtained by the ACLU through the Freedom of Information Act. In one case, witness statements among the released documents allege that four drunken Americans took a 17-year-old female prisoner from her cell and forced her to expose her breasts and kissed her. In another documented incident, troops are alleged to have smeared mud on the detained 17-year-old son of an Iraqi general and forced his father to watch him shiver in the cold. Brig Gen Karpinski, who was in charge at Abu Ghraib from July to November 2003, said she often visited the prison's youngest inmates. She said in her interview that she thought one boy "looked like he was eight years old". "He told me he was almost 12," she said. "He told me his brother was there with him, but he really wanted to see his mother, could he please call his mother. He was crying." She said the military began holding children and women at Abu Ghraib from mid-2003. She did not say what the youngsters had been locked up for. In her interview with Maj Gen George Fay, she also said intelligence officers had worked out an agreement to hold detainees without keeping records. The Pentagon has acknowledged holding so-called "ghost detainees" on the basis that they were enemy combatants and therefore not entitled to prisoner of war protections. Brig Gen Karpinski said US commanders were reluctant to release detainees, an attitude she called "releasophobia". In her interview, she said Maj Gen Walter Wodjakowski, then the second most senior army general in Iraq, told her in the summer of 2003 not to release more prisoners, even if they were innocent. "I don't care if we're holding 15,000 innocent civilians," she said Maj Gen Wodjakowski told her. "We're winning the war." The ACLU has sued US Defence Secretary Donald Rumsfeld on behalf of four Iraqis and four Afghans who say they were tortured in US facilities. Mr Rumsfeld has stated that neither he nor his aides ever condoned or authorised abuses. 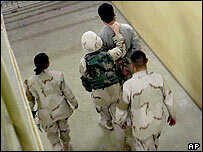 Seven soldiers have been convicted by US courts martial in connection with the scandal at Abu Ghraib. Two others are still on trial.